Reduce your Legionella risk and excessive operational costs associated with cooling towers. Do not settle for a routine/compliance clean when you can receive a comprehensive service that includes the cleaning process. We provide a full booking service which includes equipment, labour, inductions, ladders, platforms, scissor lifts, access booms, confined space testing, permits, JSA, SWIM, vacuum trucks, chemical passivation, biocide treatment, and stock re-location. With 30 years’ experience, Coolclean is trusted by leading Australian companies to reduce Legionella risk, optimise cooling performance, reduce the impact of chemicals on the environment, and save water. Coolclean carries out cooling system servicing throughout Australia. We work for quality-focused water treatment companies, air-conditioning mechanical services companies, refrigeration companies, property owners and industrial companies. 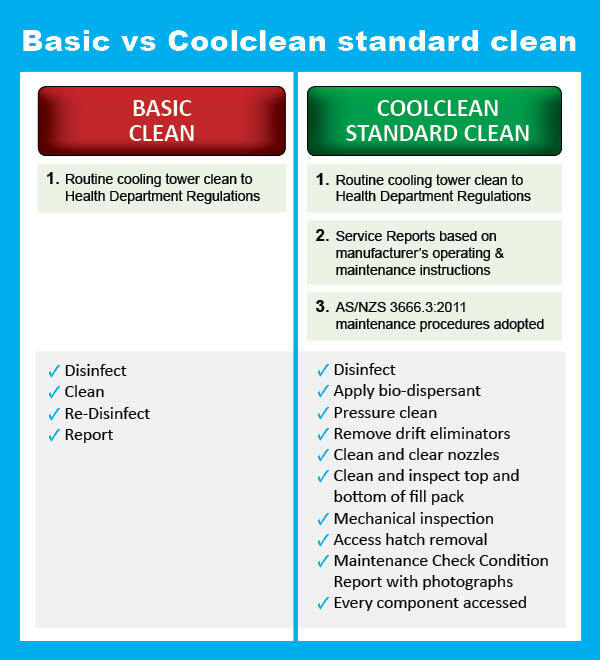 These companies engage Coolclean because they want their equipment to be serviced correctly, not just cleaned. To reduce public health risk, the correct servicing of cooling towers should be mandatory throughout Australia. 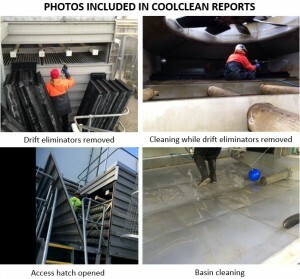 While some water treatment companies and cooling tower service providers are providing the correct service through a cooling tower specialist such as Coolclean, many are simply ‘taking shortcuts’ to reduce costs. We believe the primary focus of all cooling tower owners and service providers should be to save lives by reducing Legionella outbreaks. 1. Drift eliminators. 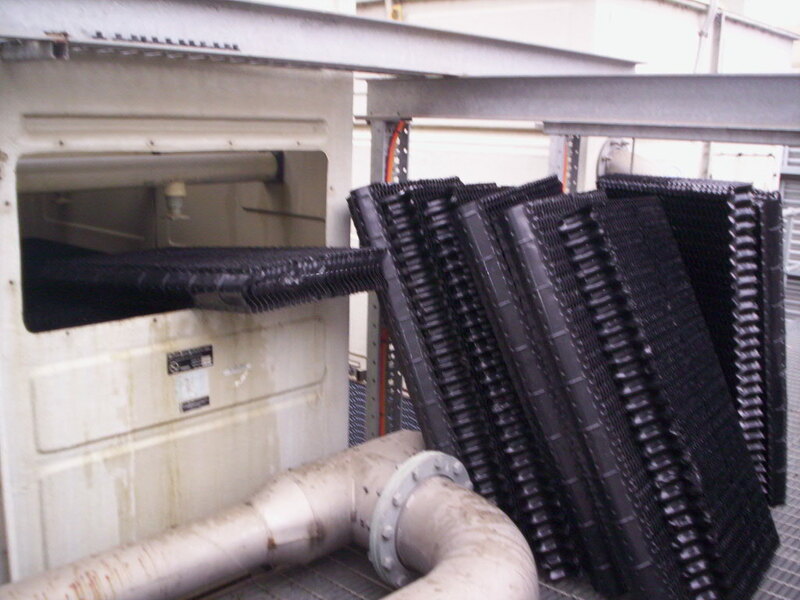 Drift eliminators help to stop Legionella bacteria leaving the cooling tower and infecting the public. Drift eliminators must be regularly inspected, kept clean and undamaged. Removal for cleaning is best practice. 2. Water distribution nozzles. Water nozzles and associated pipes/trays MUST be clean and free of debris to allow treated cooling tower water to make full contact with all internal components. Bacteria cannot be destroyed with chemicals if the chemicals do not reach the bacteria. For example, if the water is not being distributed evenly across fill pack, coils and casing, then water treatment cannot be effective as bacteria will live and breed in these areas. 3. Fill pack and coils. These are the heat exchange components. To cool effectively, the fill pack and coils must be kept as clean as possible. It is critical that water runs over the surfaces freely without interference from dirt, scale and bacteria. Dirt in cooling tower fill pack is a breeding ground for bacteria. 4. Air intake louvers. These components stop water splashing onto surfaces outside the cooling tower. Reducing water splash-out protects the environment. Updating air intake louvers to modern louvers with sunlight block-out is a major improvement to assist the water treatment program as sunlight promotes bacteria and algae growth. 5. Other items. Casing, basin, fans, motor drives, hot water boxes, strainers, pumps, ball float valves, chemical dosing lines, outside casing and the area surrounding a cooling tower. Does your current cooling tower maintenance include all of the above? If you are unsure, the solution is to request photos as evidence that these steps have been conducted. Is the servicing of your cooling tower effective? Under Government regulations, cooling towers must be disinfected, cleaned and re-disinfected at least twice per year as a minimum requirement. However, at present there are no industry control requirements in relation to the actual steps required as part of the clean. Our observation is that many companies operate only a basic cleaning regime, which does not take care of critical components such as the cooling tower spray system, fill pack or drift eliminators. During our standard Performance Service, we check all components that can impact the safety, performance or compliance of the unit. Coolclean technicians remove critical components, high-pressure clean and reassemble correctly – including difficult to access areas. 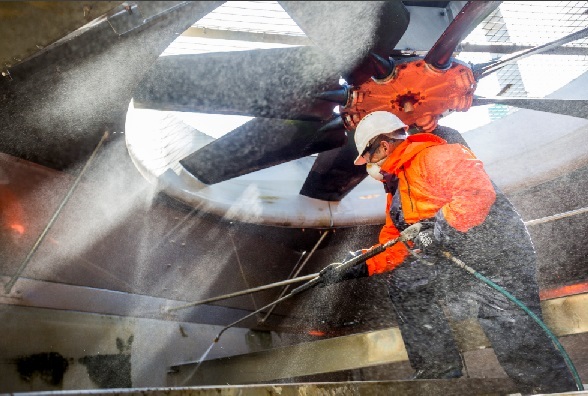 This includes the application of bio-dispersant and disinfectant, drain and isolate, followed by full pressure clean from cooling tower top to bottom, and mechanical inspection. Comprehensive reports with photos serve as proof that access hatches were removed, drift eliminators accessed, removed and cleaned, water distribution cleaned, and top and bottom of fill pack inspected and cleaned. We work to a thorough checklist (pictured, click to view). With the increased focus on risk management, we provide full reports, detailing the procedures adopted for each cooling tower, together with photos of each stage. This includes our recommendations to rectify any issues identified. 1. The water treatment program – the first line of control. 2. The function, design and condition of drift eliminators – the second line of control. What if the water treatment program fails for a few days? Although the asset value of a cooling tower might be only 5% of the building, the cooling tower often looks after expensive components such as a compressor, chiller or absorption unit. This equipment relies on the cooling tower working well. If the cooling tower runs one degree hotter, wear and tear is accelerated, corrosion increases, and the risk of Legionella is increased. Just a one degree difference makes a big difference in operation. It makes the most sense for any business that depends on a cooling tower to have a reliability-centered maintenance program, as this represents the best cost efficiency and offers the most predictable outcomes. 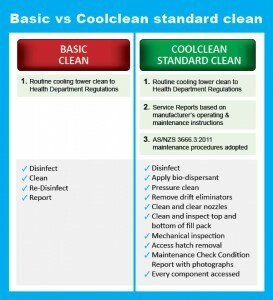 Coolclean provides a thorough approach, experienced technicians, competitive pricing and peace of mind. Coolclean offers a comprehensive Performance Service for all makes and models of cooling towers, condensers, and fluid coolers. For regular customers we maintain a register of the condition, make and model of cooling tower components. This enables us to access spare parts without delay if required. The SuperClean includes all items listed in the Performance Clean, in addition to dismantling, cleaning, and reassembly of the fill pack. Over time, cooling towers build deposits of bacteria, dirt, slime, and scale, reducing the system efficiency and providing a haven for bacterial growth. Typically, this applies to cooling towers that have been neglected or subjected to constant use. Tube cleaning is essential for fluid coolers to enhance the system’s heat rejection capability. This is critical in the paper/pulp industry, and waste water/effluent cooling. Too often, companies adopt a reactionary approach to mechanical plant maintenance. Remediation work is conducted only in response to known problems. It is essential that this approach be replaced by a focus on prevention through a proactive monitoring, maintenance and treatment program.